Julian Norman recently joined forces with Matthew Davies, Partner and Head of Immigration at Wilsons Solicitors LLP, to assist LexisNexis PSL examine the new Appendix FM guidance following the Home Secretary’s statement of changes to the Immigration Rules. Kate Beaumont of LexisPSL asked the questions. See thumbnail below for access to the full interview. 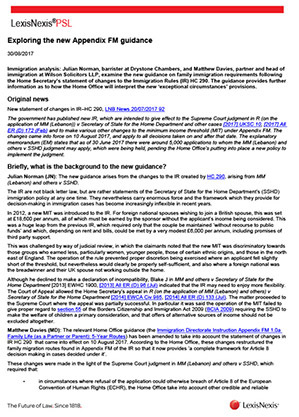 This article was first published on Lexis®PSL ​Immigration on 30 August 2017. Click for a free trial of Lexis®PSL.